Had the best time in Valencia because of the people I met in this Hostel! We did the bike tour and saw beautiful places that I wouldn't have seen without it. Also the pub crawls by tourmeout were one of the best I've done! 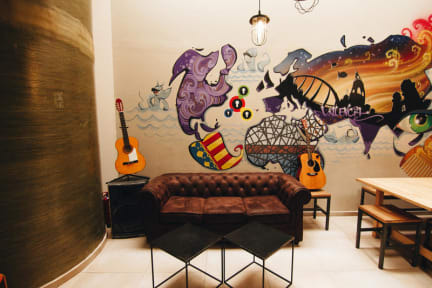 Lovely hostel, absolutely one of the best Ive ever stayed in. Felt very welcome because of the staff. They were absolutely fabulous, made me feel home and so sad to leave. Beds and rooms were tidy, loved all the extra activities that they order such as the free walkingtour and also the pub croawls at night. Big thanks to Ana, Guan, Micheal & the rest! This was such a nice hostel to stay in although the bathrooms could have been a bit cleaner. The staff was helpful and there is a good atmosphere in the bar. I'll stay here again! Had a great stay. Good facilities and location is great! Free walking tour starting at the hostel was cool! It was a ok hostel. I missed places were I can relax, because it was to busy and noisy for me. The price was the cheapest I have seen, so that was great! The rooms are ok! Basically got what I paid for. Staff was friendly, location was good. Would probably stay in an Airbnb next time just to have a bit more comfort.